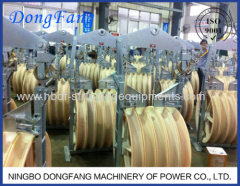 The Helicopter Stringing Blocks are used for overhead line conductor or OPGW stringing operation with helicopters. 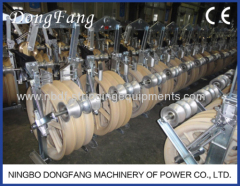 It is incorporated with a helicopter arm and specially designed pilot rope system. 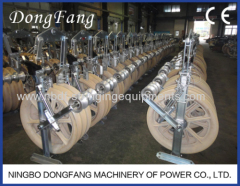 Normally it is spring controlled or wheel controlled mechanical system. The helicopter blocks can be used for modern helicopter installation of pulling or pilot ropes. 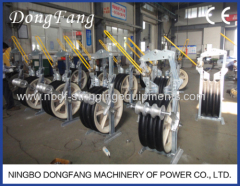 Single Sheave Helicopter Stringing Blocks are used for overhead line single conductor or OPGW stringing operation with helicopters to pull pilot rope. Three Sheaves Helicopter Stringing Blocks are used for overhead line two or three conductors stringing operation with helicopters to pull pilot rope. Five Sheaves Helicopter Stringing Blocks are used for overhead line four or five conductors stringing operation with helicopters. We designed a few typs of Helicopter Stringing Pulley Blocks according to our customer's requirements. 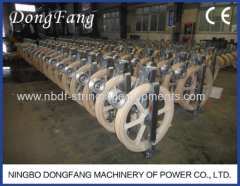 They are used for 1-4 conductors stringing. Group of Helicopter Stringing Blocks has been presented above, want more	Helicopter Stringing Blocks and Helicopter Conductor Stringing Blocks, Please Contact Us.